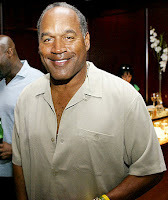 Incarcerated sports star-turned-actor O.J. Simpson is to wed behind bars, according to a new U.S. report. The "Naked Gun 33 1/3: The Final Insult" star is ready to marry a pen pal he has never met, reports the Globe. Simpson, who is serving time in Nevada for armed robbery, has allegedly proposed to "a young blonde" called Anna, and she is set to become his third wife. An insider tells the publication, "They've been writing to each other for a while now. She sent him her photo, and he just flipped for her." The source claims Simpson's latest love is a spitting image for his late wife Nicole. The former football star was acquitted of her murder in 1995. Professionally, O.J. Simpson rose to fame in his acting career with parts in films such as the television mini-series "Roots" and movies "The Cassandra Crossing", "Capricorn One", "The Klansman" and "The Naked Gun" trilogy.